25 groups honoured one of their key volunteers this year. Updated Wednesday September 27, 2017 by Kitchener Sports Association. 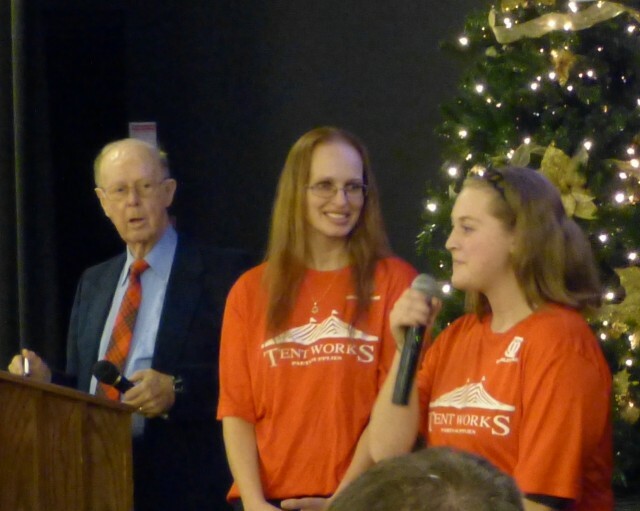 PHOTO: (L-R) Dinner MC Don Cameron looks on as Mackenzie Kolpean introduces her coach, Amanda Ducey, and mentions some of the things they've shared over the years with their Tentworks teammates under Amanda's guidance. The Stanley Park Optimist Ball program has benefited having Amanda in a key coaching role and her whole team attended the presentation to show their appreciation to Amanda. $40,000 to Pride Stables (once work is complete) for facility upgrades to their riding arena. Heather MacKneson was on hand to acknowledge KSA's support and answer questions. Cheques were also presented to groups involved with KSA's Fee-assistance Program: Sports for Special Athletes, Kitchener Minor Hockey (Donna's Kids), Waterloo Regional Boxing Academy, KW Water Polo, Kitchener Minor Baseball, Pride Stables, Stanley Park Optimist Ball, KW Minor Boys Softball, KW Gymnastics and ROW Swim Club. Thanks to all the local sports groups that offer fee-assistance so everyone gets to play -- we're here to help!